​​Artist Zoe Gilmour spent 6 weeks in residence at St Vincent’s House exploring the Victoria and Albert Museum’s Gilbert Collection with residents in one-to-one bedside and group sessions. ​The Gilbert collection features a dazzling array of enamel miniatures, elaborate micro-mosaic furniture, bejewelled snuffboxes, gold and silver decorated cups and much more, all collected by Sir Arthur (1913 – 2001) and his first wife Rosalinde (1913 – 95) to decorate their Californian retirement home. After Rosalinde’s death with dementia in 1995, Arthur requested that the precious collection of ‘beautiful things’ they chose to bring home from their travels be accessible to people living with dementia locally, and as part of the V&A’s expanding offsite work, Resonate worked with Zoe to bring the collection to life with St Vincent’s House. 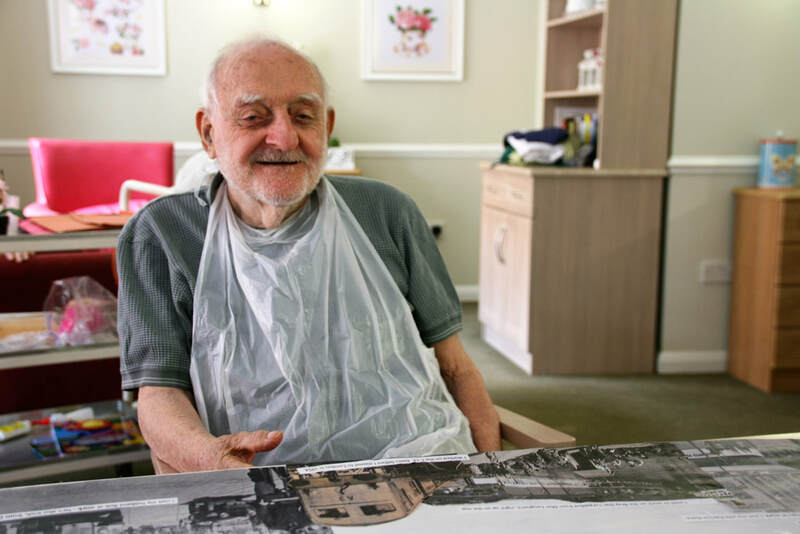 Visiting residents in their rooms and meeting them in the lounge, Zoe worked with each resident to create personalised artworks inspired by their interest in objects from the Collection and stories from their lives. Zoe and Lucy also worked with a group of residents to make two table coverings, inspired by a Barberri table in the Collection, celebrating places and sites of significance to each participant throughout their lives. These images were made into two cushions for the lounge, and the project was celebrated in a book featuring the artworks, interactions, and words of the residents and staff of St Vincent’s House.